Nowadays markets are flooded with food supplements all promising to be the best for you or your child. They promise weight gain, increase in height and increased overall health and immunity in the person who consumes it. It can get very confusing while deciding which one to choose for your loved one. An important tip though is to read the labels well to understand the contents and their quantities before you take your pick. A quick consultation with the doctor is also helpful in times of confusion. 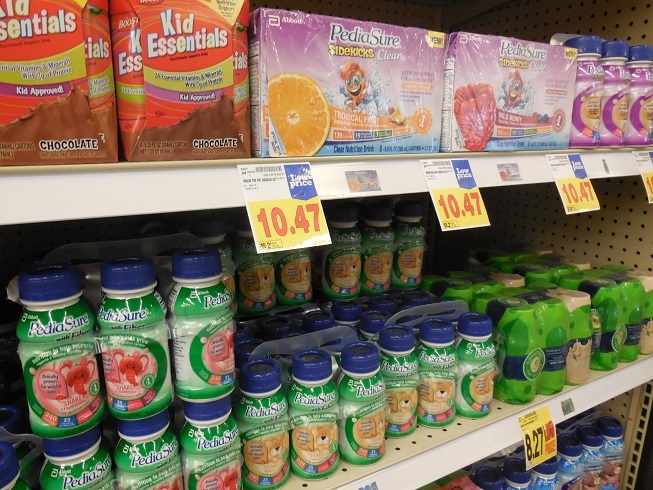 Pediasure and Ensure are health drinks made by the same company Abbott Nutrition for two different set of populations. Pediasure has been designed for kids whereas Ensure has been developed for the adults recovering from some major illness, frail people and the elderly. The sole intention of both these drinks is to provide extra nutrition and supplement the regular diet. Kids are known to be fussy eaters and generally do not consume the recommended daily dose of carbohydrates, fats, proteins, vitamins and minerals from their regular food. This especially happens when they are teething or recovering from cold, fever or flu. Some kids are small for age in terms of height and weight. These kids benefit a lot from consuming at least 3 glasses of pediasure mixed with milk per day. It helps to reduce the frequency of falling ill by increasing the child’s immunity. Pediasure contains the recommended calories for kids and also the right amount of vitamin A, Biotin, Vitamin B12, magnesium, zinc, selenium, copper and chromium which is important for the physical and mental development of the child. It is very important to give the right amount of nutrients to the children as overdose of any of the vitamins like Vitamin A can be toxic instead of beneficial. Pediasure is recommended for kids between one two ten years. It contains 240 calories and healthy omega-3 fatty acids and prebiotics which increase the growth of healthy bacteria in the gut. This improves digestion and increases appetite. Though it is a health drink it must not replace the child’s regular diet. The child must be encouraged to eat his share of vegetables, fruits and carbohydrates along with this health supplement. The health drink must be treated as a supplement only. It is available chocolate and vanilla flavours to satisfy the taste buds of the child. Ensure on the other hand has been developed for weak, fragile adults or elderly people who are low on energy levels. It contains the same amount of calories as Pediasure for the same weight but has higher amounts of Vitamin A, Vitamin B12, biotin, selenium, copper, magnesium, chromium and niacin. The dosage is adjusted as per the requirements of the adult and geriatric population. It cannot be given to kids as the nutritional content is different in terms of weight. It is generally recommended in hospitals when a person is recovering after a major illness or surgery and is not able to consume solid food. Ensure mixed with a fluid is given through gastric tube to fulfil the daily calorie and nutritional needs of the patient. Ensure is not prescribed to people suffering from Galactosemia – a disease in which there is a problem with digestion of galactose sugar. Pediasure and Ensure are health supplements recommended for children and adults respectively. You cannot give Ensure to children or Pediasure to adults as the nutritional requirements of each age group is different. Maitreyi Naigaonkar. "Difference between Pediasure and Ensure." DifferenceBetween.net. September 28, 2017 < http://www.differencebetween.net/science/health/difference-between-pediasure-and-ensure/ >. wife is recovering from an operation. Doctors advised her protein diet. She has lactose intolerance. Can she take ensure. Please advice. Thanks. My Dr. gave me about 15-20 free bottles of Pediasure after I suffered a lot of weight loss due to thyroid problems. That was about 4 weeks ago and I’ve noticed a solid bulk up of weight. So, in a pinch, Pediasure will work for adults, especially if you’re Dr. Gives you 15 free bottles!! How many did you drink a day? I just bought 2 cases for myself and I’m 26,I wanted to try this before ensure. I m 36 years old. I like pediasure so much. I used to drink every day. Would it increase my weight or not? My doctor has perscribed ensure instead of pediasure to my 8 year old! I know they say that dr knows best but im sceptical on giving him this now after reading the info. I dont want my son to overdose on vitamins!